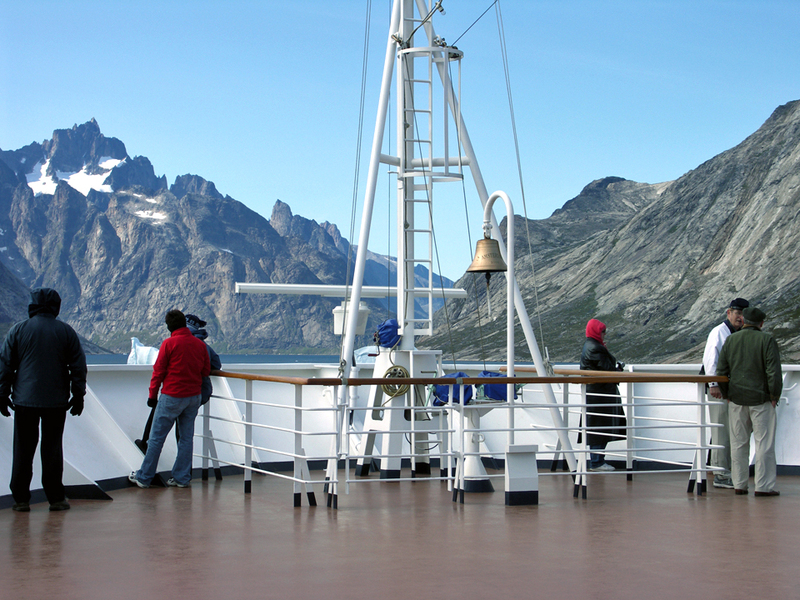 We were approaching the southern end of Greenland, Cape Farewell, known to the Inuits as Nunaap Isua, “The Land’s End”. We glided past floating sculptures shaped by wind and weather, frozen reminders of ages past, shimmering shapes in a sparkling sea, the sky a clear cerulean. On both sides, dramatic peaks soared nearly 5000 feet above, dwarfing us as we sailed past icebergs and waterfalls in a pristine wilderness. This was the rarest of days in Ikerasassuag, “The Long Channel”, Prince Christian Sound. We were in the southernmost tip of Greenland, in a network of narrow channels and fjords accessible only when thawed sufficiently to allow passage and navigable only when the characteristic thick fog is absent. We could not believe our good fortune. We passed just one settlement in this area of the world’s most spectacular fjords, a remote village of under 200 residents on a small promontory beneath a 2970´ mountain that drops so steeply to the water’s edge that villagers can walk no farther than 1.2 miles. 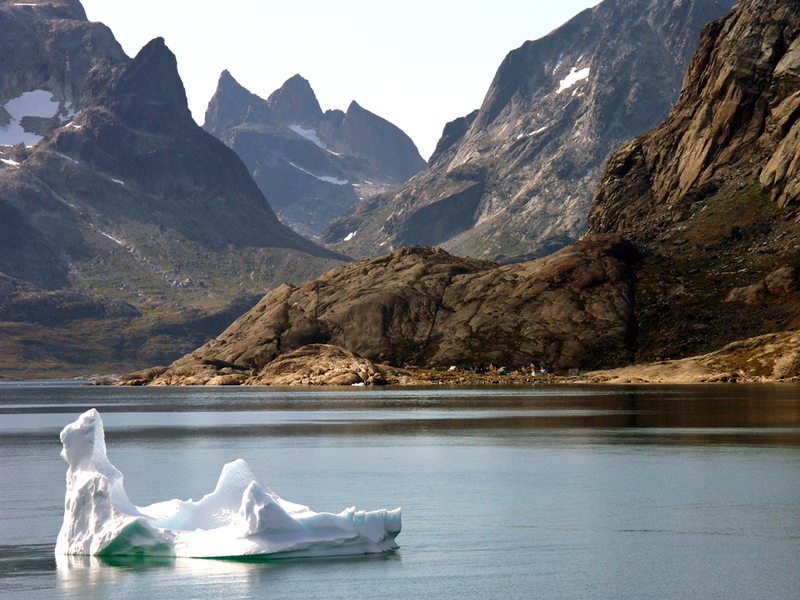 Aappilattoq is approachable by boat only from July to late autumn, and reached by helicopter other times of the year. We were in the land of dogsleds, kayaks, glaciers and icebergs, a country mostly north of the Arctic Circle, a land carved by Ice Age glaciers and characterized by its harsh and challenging environment. North of the Arctic Circle the sun does not appear for three months in winter. Existence in outer areas is as one with nature, dependant on the hunt for fish, seals and whales using skills passed down through the generations. It was August, a good time to spot whales—minkes, humpbacks and killers—outside the channels. Ringed, harp and, most commonly, hooded seals flourish and are an important food source. In late spring and early summer a hungry polar bear may be seen drifting along on an iceberg. At the intersection of the Atlantic and Arctic Oceans, Greenland is the largest island in the world and geologically one of the oldest formations on earth. It has an Arctic climate, with frigid waters and cold air from deep interior ice fields three times the size of Texas and second in size only to that of Antarctica. The icecap covers over 80% of the land mass and holds 10% of the world’s water reserves. If it melted, the world’s oceans would rise 23 feet. 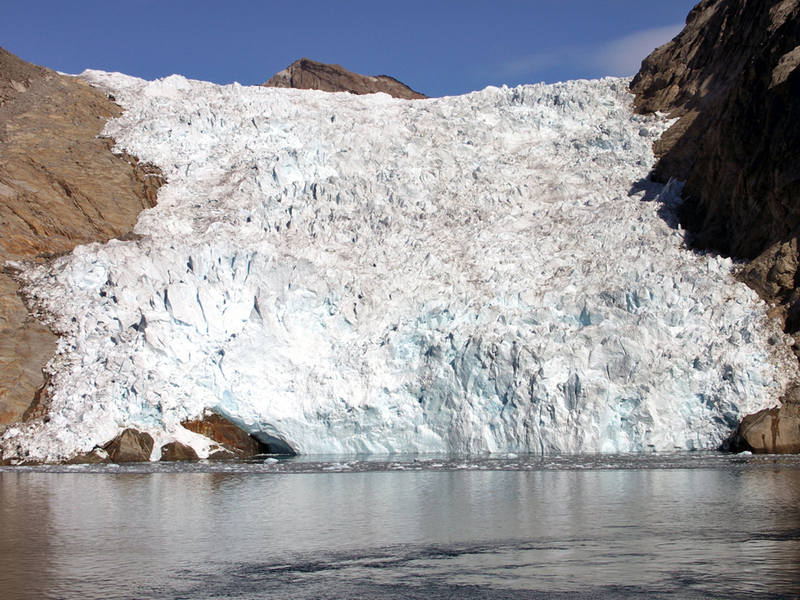 This glacier is a river of ice spilling slowly down to the sea from the Greenland Icecap. Glaciers sculpt the land and flow from the interior ice fields out to the sea, creating thousands of icebergs annually, some as large as the state of Rhode Island. Amidst the glaciers are towering peaks known to the Eskimos as nunataks, jagged from freezing and thawing through the ages, soaring high above the vast glacially eroded and rounded landscape, examples of the ravages of geologic time. Fishing dominates the economy and exports. Greenland also has sheep, gold, diamonds, and oil reserves, drilled offshore. Qaqortoq is a fishing port teeming with icebergs. 7/8 of an iceberg is beneath the sea. Today, over 90% of the 60,000 inhabitants live along the more temperate west coast. 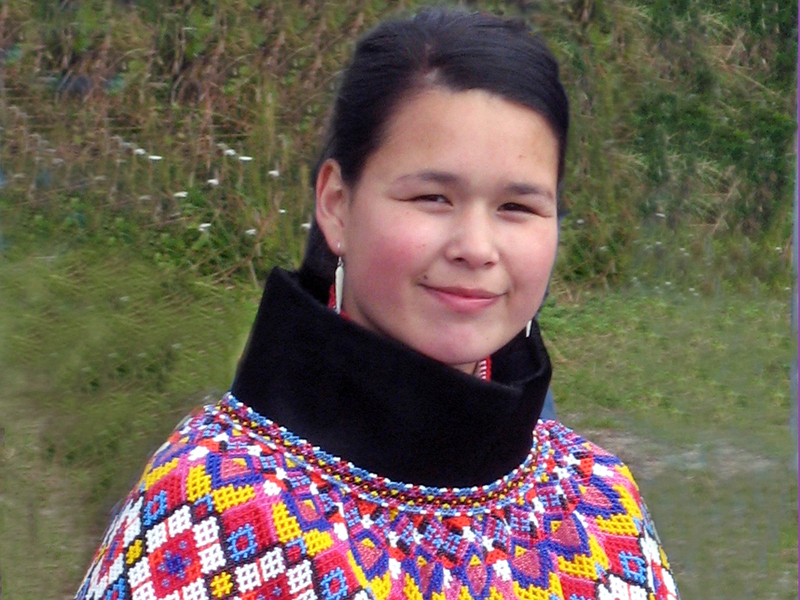 Most are Inuits or native-born Caucasians. Others are primarily Danish. Greenland has been part of the Kingdom of Denmark since the uniting of Norway and Denmark in the Kalmar Union. Once a colony, it now has Home Rule with two seats in Parliament and substantial financial support, financing modern amenities and technologies. Life expectancy has increased to 70. Powerboats and helicopters often replace dogsleds and kayaks. The Greenland we visited was not, as alleged, a misnomer created by Eric the Red to attract settlers to an Arctic climate. In the southwest, the North Atlantic Drift, a warm ocean current, a continuation of the Gulf Stream, brings a warmer climate with ample sunshine. There are hilly pastures for sheep in the milder fjord settlements and waters teeming with marine life. Eric the Red, banished from Iceland, discovered and began to colonize South Greenland in 985 AD. At its peak there were thousands of colonists and hundreds of farms in Greenland. Eric’s son, Leif Ericsson, or Lucky Leif, sailed from here to North America around 1000 AD. In celebration of a special anniversary and birthday we booked Holland America’s Voyage of the Vikings. In contrast to those arduous early explorations by longboat, we were aboard the Amsterdam, relaxing with room service on our sunny veranda, spellbound by the beauty of our surroundings. 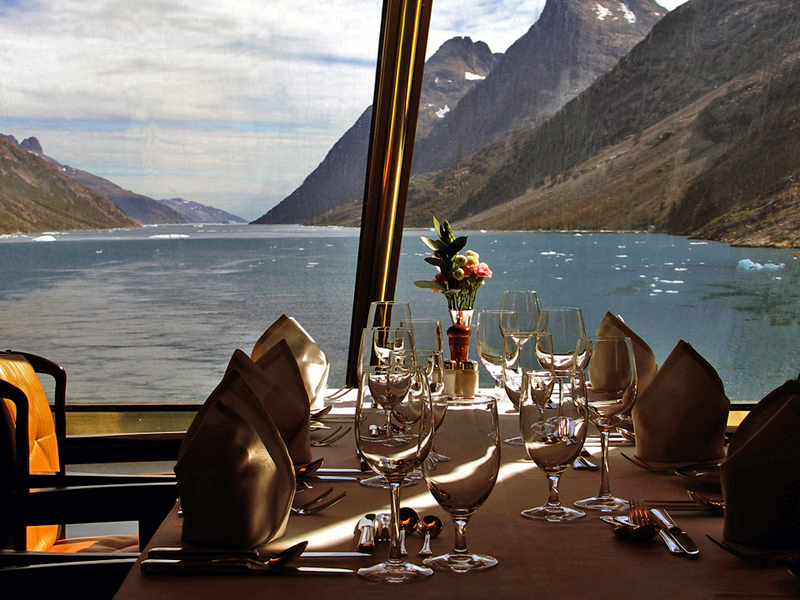 Lunch in the dining room included a superb view of Prince Christian Sound. The journey thus far had been exceptional, but never had we expected to experience a day as extraordinary as this. The scenery that surrounded us drew gasps from even the most sophisticated travelers among us. Photographs cannot do justice to the scale and magnitude of one of nature’s most extreme creations. We continued to the more moderate climate of the southwestern shore, to the largest town in South Greenland, where summer temperatures can reach 70º. Port city, Qaqortoq, “the white”, teems with ice floes. Founded in 1775, it is connected to other towns by boat or helicopter, not roads. About 90% of the 3500 residents live in town, the rest in surrounding sheep or reindeer farms. Greenlandic and Danish are spoken, with many also speaking English, particularly in summer when students are in town. English words of Greenlandic (Inuit or Eskimo) origin include kayak, anorak and igloo. Harbor fishermen arrive with the day’s catch. There are brightly colored contemporary houses prefabricated in Norway and well-preserved buildings from colonial days, some over 200 years old. 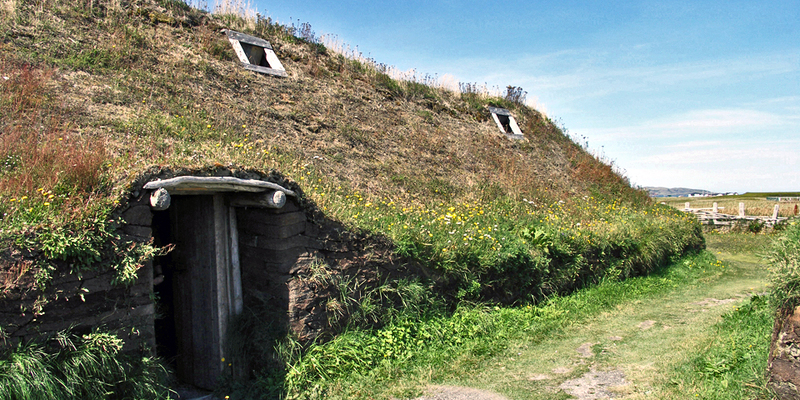 The Tourist Information Office is across from the dock and excursions are offered by land, sea, and air — around town and to Viking ruins, an agricultural research facility, and the icecap by helicopter. Internet access is available for a fee. Young women wear red, single women white, and older women have costumes of dark blue and yellow. All have warm sealskin pants. We were greeted by young ladies in the Greenlandic National Costume–warm and colorful outfits with harbor seal slacks. A short excursion is offered showing the hard work that goes into sewing these Greenlandic National Costumes, traditionally worn on holidays, for confirmation, weddings, birthdays, and the first day of school. 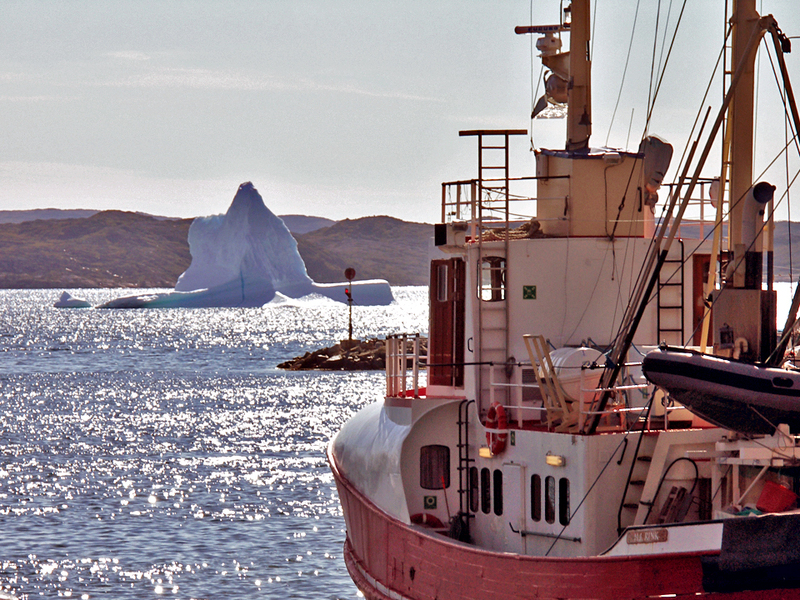 Whether on a guided tour or exploring on your own, Qaqortoq offers much to see and do. The town itself is a unique sculpture park. 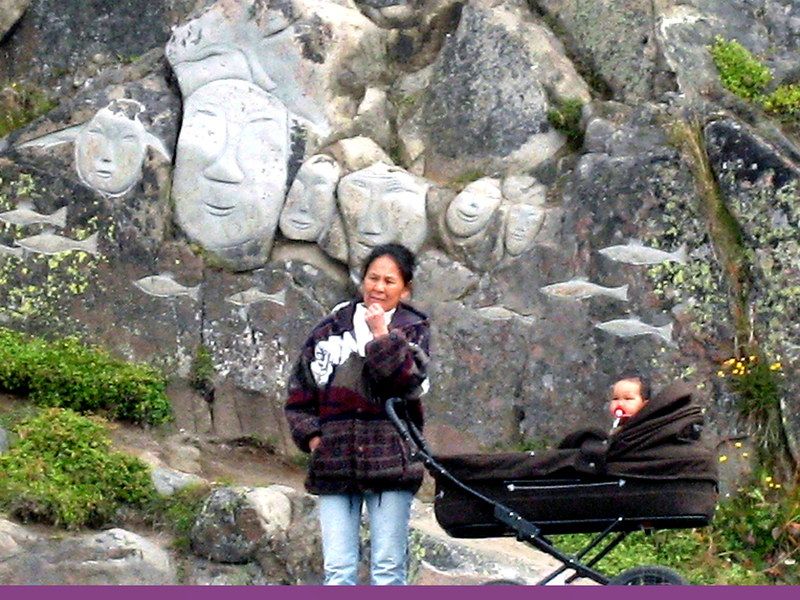 “Stone and Man” was begun by artist Aka Høegh, a sculptor who imagined faces when she played on the rocks as a child. Her fantasy was carved into reality by artists from all over Scandinavia in a project that continues to draw artists each year. Great Greenland, the only tannery in Greenland, has thousands of seal and polar bear skins in piles. Their high quality fur coats, boots, and accessories are displayed in their showroom, but cannot be imported to the United States. The oldest fountain in Greenland is surrounded by an old and a new church, an open air fish and meat market, and a small museum of Inuit and post-colonial history with historic photographs and contemporary art. Where else will you have the opportunity to sample mattak– raw whale skin with thin layer of blubber–or the national dish suaasat, a seal soup with rice and onions? Restaurant Napparsivik, in the Town Square, serves a “Taste of Greenland” including a variety of Greenlandic delicacies. For another authentic experience, guides stand by with kayaks for scenic tours. Excursions outside the city take you to Upernaviarsuk, the Research Station of Agriculture, or by helicopter to Tvillingebræen to touch and taste the icecap. For shoppers there are Inuit dolls and warm clothing. 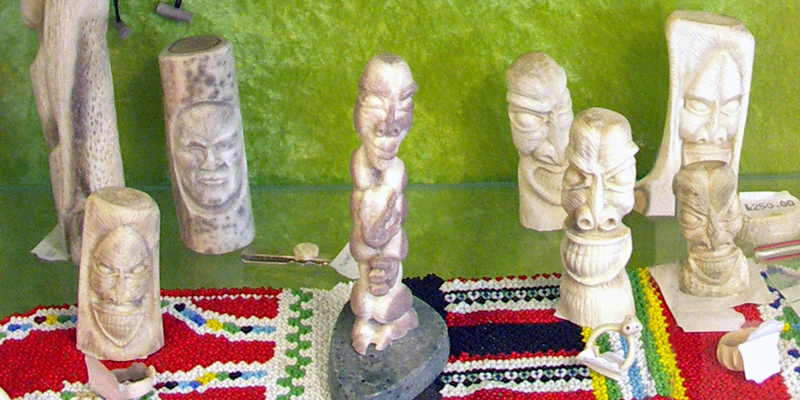 Tupilaks are grotesque figures usually of stone, bone, antlers or ivory. These unique carvings of real or imaginary creatures and evil spirits incorporate interpretations of ancient myths and legends and were originally created as protection against enemies. Some are of carved from endangered species such as sperm whale ivory. A CITES permit may be needed to bring them home. The grass roof is long gone, but the thick stone walls of Hvalsey Fjord Church remain in this pasture where sheep continue to graze. 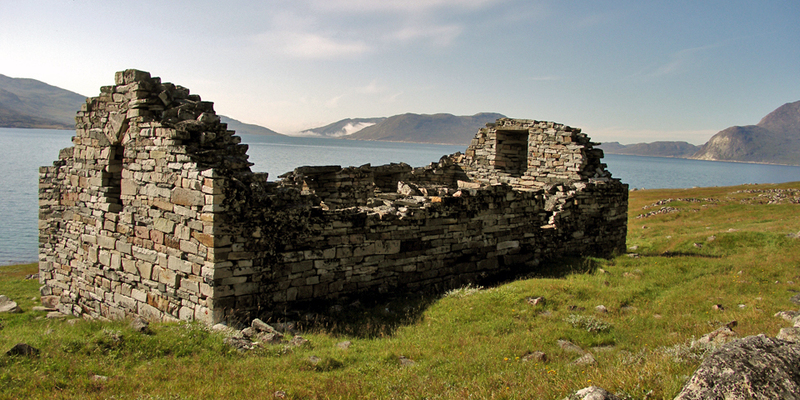 We took a local boat around Arpatsivik to the Hvalsey Fjord Church, site of the best preserved ruins from the times of Norse settlements in this area. The thick stone walls of the church remain untouched and together with ruins of the prestigious great hall are surrounded by foundations of farms and living quarters of the old Norse village. Sheep continue to flourish here today. According to the Icelandic Landnamabok, Thorkel Farserk accompanied his maternal cousin Eric the Red to Greenland and claimed this fjord. Later inhabitants were his descendents. Like their Icelandic counterparts, the pagan Vikings of Greenland converted to Christianity, and churches were built throughout the settlements. However, when missionaries came in the early 1700s in search of the Norse colony, they found only Inuits. They made drawings of the church, which remains unchanged. The last church record was of the three-day wedding celebration of Sigrid Bjornsdottir and Torstein Olavsson, an Icelander, in 1408. The couple remained here a few years and left for Iceland. Thirty-something generations later, in 1992, relatives of these early settlers returned to this spot for their wedding. The Icelandic Sagas recount the events, coastal voyages, and maps drawn by the Vikings. Yet the cause of their disappearance remains a mystery. Trade, particularly in walrus tusks, the only known source of ivory, was an important part of everyday life. Some believe a minor Ice Age occurred about that time in what had been a mild climate. Were shipping lanes blocked? Was there a shift in trade routes, attacks by Inuits from the north, pirate raids, or insect infestation and crop reduction? Or had the reported corruption in the church and its financial demands ultimately destroyed the settlement? As early as August, when darkness returns to the Arctic night sky, the spectacular natural phenomenon of the Northern Lights, or Aurora Borealis, creates the biggest light show on earth. Electrically charged particles of the solar wind are trapped in the magnetosphere and follow the earth’s magnetic field to the poles, colliding with the gases of the upper atmosphere and intensifying during solar flares to create a dazzling display of vibrant color dancing across the sky. The stars appear especially bright when out to sea, and an expert from NASA was on deck to help us spot the constellations and enjoy the Northern Lights. And what could be more romantic than spending the rest of the evening enjoying the celestial fireworks under a warm blanket on our veranda? Uncommon experiences are among the many benefits of repositioning and Transatlantic cruises, usually offered in spring and fall when ships are relocated between popular seasonal destinations—Europe in summer and New England in fall, for example. These voyages often include stops in remote areas, tend to be outstanding values, and have taken us to places we would never otherwise have the opportunity to experience. With more sea days, the pace is unhurried, with plenty of time to learn more about the ports from onboard experts, or to simply relax and enjoy the sea. Our voyage continued as we followed the icebergs to Vinland, now known as Newfoundland, where, in the 1960s archaeological evidence proved, as the Icelandic Sagas had long revealed, that Leif Ericsson was the first European to reach our American continent. © 2014 : All Rights Reserved. No part of this site may be reproduced, copied, or borrowed without contacting us for written permission. Contact information is available under the About Notable Travels tab at the top of the page.